It's happened! The demo/tutorial is now an online shared area. This update took more work than expected so next few updates should have some more quality of life changes. Back to menu button in settings. Basic controls listed in settings. Chat now exits after sending a message. A toggle option may be added to choose between send and continue chat messaging or send and go back to character controls. The demo is now online and will stay on indefinitly. This will be the test bed for the rest of the game's core features until we return back to the game's larger in limited playtests. Now online so report anything that broke from the demo before. 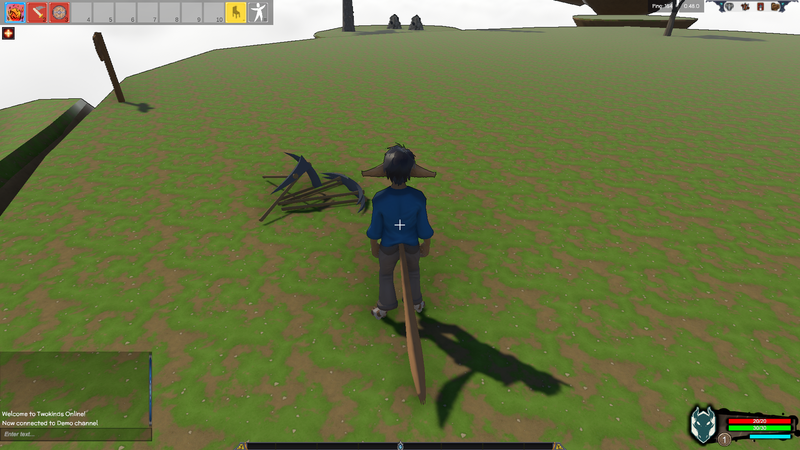 Combat mode is needed to mine, chop wood, harvets plants etc. Toggle that with [TAB] or by attacking with left mouse click. This will be made more friendly in a later update. Exit game button freezes at the end of the countdown. SpatiaOS GDk to version 0.2.0. SpatialOS Platform Sdk in use. Here's a deeper look into the underlying tech! We use Unity for the game engine and SpatialOS for the networking. If you were following tech news, Unity and the company behind SpatialOS, Improbable, had a licensing issue in January that almost disconinuted development for the Unity sdk. This has since been resolved, greatly lowering Judah's stress level. Major update for our networking stack. It took a few days of error fixing from api changes but so far has been worth it. There were some performance issues in the editor but now that seems to be fixed. This also broke the offline demo because of the underlying changes so there's no going back now! It's been a while since the deployed cloud connection has been tested so it was a rush to find the issues for the connection. Due to copying and pasting from many examples, the default connection was set to only connect to local testing servers. A lot of research into the newer Platform SDK, the game connection now works and is nearly ready for multiple world shards. The login system is going to be overhauled soon. Playfab offeres player profiles, character data, items, and other bells and whistles. It is used for a lot of games and is worth switching to, compared to using and paying for other services we have to create ourselves. Probably will cause a hiccup later, but right now player accounts are being generated during game login so it should be seamless for a lot of users. The platform Sdk allows us to manage the server deployments and sharding. The integration right now allows us to have the demo server and playtest server seperate. In the future, we can have US, EU, and special servers that players can pick and connect to instead of just automatically launching into the default. This runs on the webserver where the game client can request login tokens and current accessable game servers.